Last month I had the opportunity to stay in the ‘Architecture and Art’ Nhow Hotel in Rotterdam. 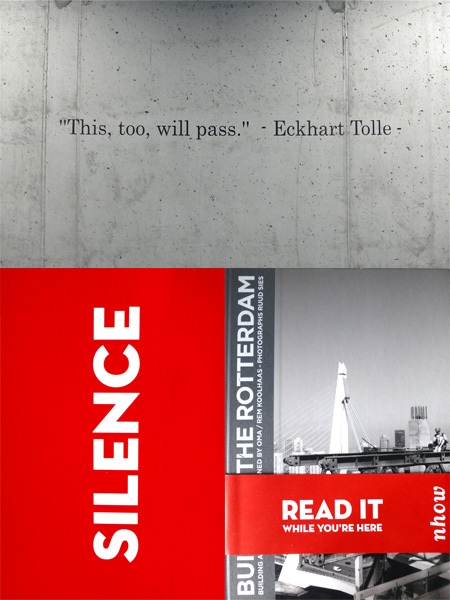 Work of young photographers highlight corridors of the hotel and each one of the 23 floors has it’s own Eckhart Tolle wisdom quote on a bare concrete wall. In my room I, not only enjoyed the view and silence, but also the beautiful black and white picture book by Ruud Sies, about the 4 years construction of the impressive high-rise building. Both, the 44 floor building and the hotel, are designed by Rem Koolhaas/OMA.